Mrs. Elizabeth Isabella Colson, 73, of 2720 Bayou Blvd., died Monday afternoon. 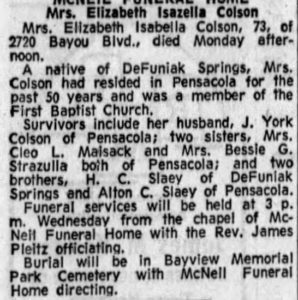 A native of DeFuniak Springs, Mrs. Colson had resided In Pensacola for the past 50 years and was a member of the First Baptist Church. 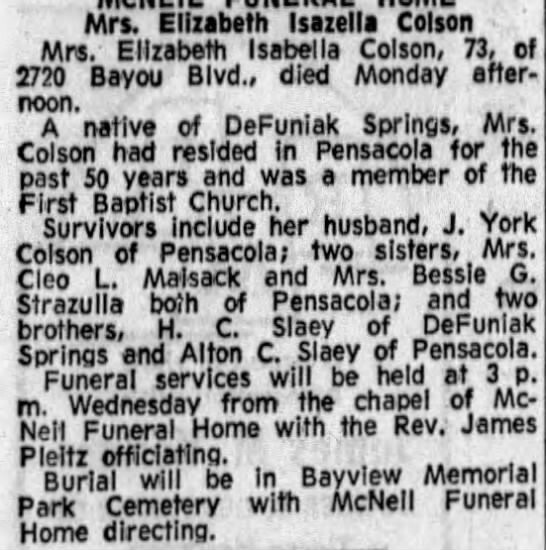 Survivors Include her husband, J. York Colson of Pensacola; two sisters, Mrs. Cleo L. Malsack and Mrs. Bessie G. Strazulla both of Pensacola; and two brothers, H. C. Slaey of. DeFunlak Springs and Alton C Slaey of Pensacola. Funeral services will be held at 3 p.m. Wednesday from the chapel of McNeil Funeral Home with the Rev. James Pleitz officiating. Burial will be In Bayview Memorial Park Cemetery with McNeil Funeral Home directing.